Inspired by roaming through the streets and alleyways of Greece, the Santorini Cheese Knife Set is here to take your dinner parties to the next level. 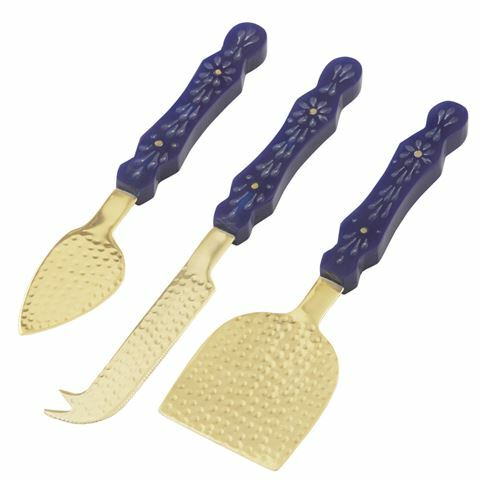 Crafted from stainless steel with a lavish gold-toned finish, each item in this three-piece set features a dimpled texture, while the beautifully-designed resin handles are embellished with delicate flowers while providing the perfect grip. Crafted from stainless steel and resin. Ergonomic handles are painted with delicate flowers. Presented as a set of three in an Amalfi gift box. Soft Cheese Knife – 22.5cm (l). Hard Cheese Knife – 20cm (l). Cheese Spade – 19.5cm (l).